For more than a decade, wine marketers have fervently sought the hearts and palates of the Millennial generation. Though still focused on Millennials, some wine marketers are beginning to pay attention to the oldest members of a new generation who are now in their early 20s and entering the beverage alcohol market. The first issue to address? What to call them. For many pundits and business writers outside and inside the wine industry, “Generation Z” is often used to describe those who are younger than Millennials. This is a misnomer that does not take into consideration the generational research and work of demographers in weighing the factors that go into generational boundaries and definitions. There is, of course, a “Generation X,” which led briefly to “Generation Y” and now to “Generation Z.” But before “Generation X” became a description of the smaller generation following Baby Boomers, demographers referred to them as the “Baby Bust” generation, using the same metrics of rising and falling U.S. birth rates that defined Baby Boomers. To Coupland, the “X” in “Generation X” had nothing to do with alphabetical order but referred to an “unknown,” as in mathematics. The term “Generation X” stuck because it perfectly described the demographic cohort it represented, and has been accepted by marketers and academics alike. “Generation Y” was a short-lived “placeholder” term, replaced by one that is truly defining – Millennial – an apt description for the first wave of Americans to enter adulthood in the new millennium. So, just as there was no “Generation W” preceding Generation X, there will be no “Generation Z” following the Millennial generation. There are no governing bodies or universally accepted methods for defining and naming the generations. In fact, the Baby Boom generation is the only generation with an established definition accepted by the U.S. Census Bureau. But there are two authoritative groups with a long history of tracking and reporting on the subject of generations – the publishers of the American Generations series of reports, and the Pew Research Center. These two organizations are fairly close in the age ranges they set and the terminology they use to define the generations. A comparison of their definitions can be seen in the chart below, which shows the age ranges of the generations in 2019. At Wine Opinions, we use the definitions set by the 8th Edition of American Generations to analyze survey data by generation. Pew Research has set an age range for Millennials that is the same span (16 years) as their age range for Generation X. The age range for Millennials set by American Generations uses the guidelines they have adopted for setting the span of other generations – the rising and falling of the birth rate in the U.S. Each of these methods is sensible and offers some advantages. While generational comparisons and analysis are often useful in consumer research, these broad age segments are not always key drivers of behavior. At Wine Opinions we often analyze behavior and attitudes by gender, “age bands” (20s, 30s, 40s, etc. ), region, media usage, and other such demographic or behavioral groupings. With regard to the generation following Millennials, Pew Research issued a statement in March of 2018 stating that they had set their cutoff birth year for Millennials as 1996. 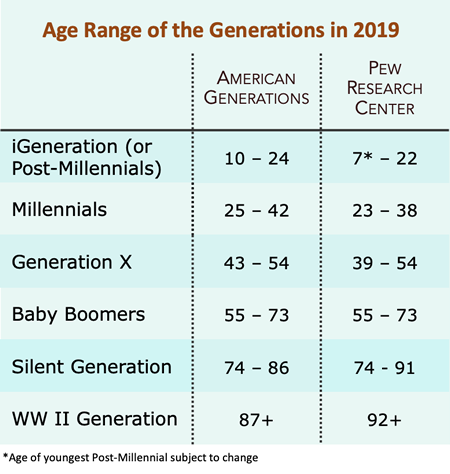 Anyone born from 1997 through 2012, in the view of Pew Research, belongs to a generation they refer to as “Post-Millennials.” Pew believes it is too early to name this youngest generation, and they caution that their Post-Millennial ending birth year is still subject to revision. In American Generations, though, those definitions have been set. Noting that the birth rate in the U.S. stabilized in the mid-1990s, and fell once more in the onset of the Great Recession, the group they call the “iGeneration” is defined by the birth years 1995 through 2009. In her book, “iGen,” Jean M. Twenge Ph.D., a professor of social psychology, notes that today’s teens are the first generation to have spent their entire adolescence in the age of the smartphone, and that social media and texting have replaced other activities for them. Dr. Twenge’s work draws on surveys of 11 million young people, as well as interviews, and details how the changing world around them has affected them. At Wine Opinions, we are now getting consumer survey responses from the first wave of iGeneration young adults, ages 21 – 24. While the numbers are not sufficient yet for statistical significance, we are finding that when they are compared to the very youngest Millennials (25 – 29) there are a few encouraging signs. For example, in a very recent survey we found that wine consumption frequency of the two groups was only slightly higher for Millennials. Perhaps not surprisingly, the iGeneration group is somewhat more reliant than the Millennial group on wine advice from friends or family members, and they also gave a bit more weight to the value of wine scores or ratings when choosing a new wine, compared to Millennials. In the coming year, we will learn more about the leading-edge iGeneration members as they enter the world of wine. We are now recruiting this age 21 – 24 cohort to our national Wine Opinions consumer panel and look forward to providing insights on their wine preferences, attitudes, behaviors, brand familiarity, media consumption, and other factors of interest to wine marketers through 2019 and beyond. Meanwhile, please call them the “iGeneration,” or “Post-Millennials.” Or wait for the Pew Research Center to offer its alternative. WHEN DO RESPONDENTS TAKE SURVEYS? Wine Opinions was formed in 2005 – a time when the shift from random dialing consumer telephone surveys to online surveys of consumers was well underway. At Wine Opinions, be believed that the best and most efficient way to engage U.S. wine consumers was on the Internet, and our supposition has proven to have been correct, as today nearly all wine consumer quantitative surveys are conducted online. Our market advantage is that we were the first research organization to assemble an online panel of U.S wine consumers, with significant skews toward those who drink wine frequently and those who frequently buy wines costing $20 and over. A recent survey conducted by the Pew Research Center confirms our rationale. Nearly all U.S. adults are online, as only 13% say they do not use the Internet, compared to 48% not using the Internet in a baseline survey conducted in the year 2000. Age is the greatest differentiator, with only 1% of those ages 18 – 29 not online, compared to 41% of those who are age 65 or older. There is also a skew among those not online to having less than a high school education (34% not online, compared to only 3% of those with college or higher educations). And there is a related skew among those not online to the lowest household income levels. There are only small differences among the genders or ethnic groups, but there is a somewhat greater skew among those not using the Internet to rural communities (22%) compared to urban (12%) or suburban (11%) communities. There are now nearly 17,000 members of the Wine Opinions consumer panel nationally, covering all major demographic segments, and they are a valuable and continually growing resource for wine marketers seeking insights on the probability of market success for their products. At Wine Opinions, we recently conducted an online panel discussion with 10 wine drinkers, all of whom turned 21 in 2016. These young adults are among the leading edge of the generation following Millennials – called the “iGeneration” (defined in American Generations, 8th Edition). This was a purely qualitative exercise, a discussion of beverage alcohol usage among the participants – several of whom were still in college, with others just starting careers. They were recruited and screened for their current usage of wine. Half of the group stated their wine consumption to be, on average “a few times a week,” while two stated wine consumption to be about once a week and the remaining four participants stated their wine consumption to average once every 2 – 3 months. They were equally divided between males and females, though females on the whole were the most frequent wine drinkers. As might be expected, cost was a major factor across all types of beverage alcohol purchases, but most were willing to pay $10 for a glass of wine in a restaurant and up to $20 – $30 for a bottle of wine to enjoy at home, though their most frequent wine purchases were in the $10 – $15 per bottle range. Of interest is that none of group expressed any “fear of wine” or uncertainty in their wine shopping experiences, and several cited good values in wines they had recently purchased from both Trader Joes and Costco. As these newly-minted adults move into the beverage alcohol market, Wine Opinions will be conducting more qualitative and quantitative research on their tastes, attitudes, purchases, and usage of wine. There will certainly be much to learn. A key finding from the Wine Opinions report – American Wine Generations – has been questioned on social media but the findings are verifiable. But the facts speak for themselves. What those tweeters neglected was that winery visitation measured in a recent Wine Opinions consumer survey was from a survey limited only to High Frequency wine drinkers (those who, on average, drink wine either daily or several times a week). Only one in three U.S. wine consumers is a High frequency wine drinker, but they account for about 85% of all the wine purchased. In short, they are the people who truly love wine; they are involved in wine and interested in learning and discovering more. So that fact that among these wine drinkers, 75% of the Millennials in this group report that they have visited at least one winery in the past year is rather unremarkable. Greater percentages of High Frequency wine drinkers who are Gen Xers and Baby Boomers have visited at least one winery in the past year (77% and 78% respectively) so this bit of data should come as no shock to anyone. Further, Millennials make up a significantly smaller proportion of High Frequency wine drinkers than Baby Boomers (38% of all High Frequency wine drinkers are Baby Boomers, while 30% are Millennials). So, we are talking about a much smaller group of Millennials than Baby Boomers. Anyone looking dispassionately at the facts will agree that the 79 million U.S. Millennials are of critical importance to the wine industry and its future. And there are, in fact, more wine-drinking Millennials today than there are Baby Boomers. We should rejoice in the fact that (like older generations) wine has a special appeal to a good many Millennials, and this includes winery visitation. 2015 and 2016 are milestone years on the U.S. wine market. In 2015 the World War II generation sank to single digits in millions, less than the population of New Jersey. The youngest member of the Swing generation, though more than a dozen years behind the World War II generation, turned 70 in 2015 and Generation X saw their oldest members reach 50. And at the end of 2015, the very youngest Millennial turned 21 on New Years’ Eve. In 2016 the oldest Baby Boomers will turn 70 years of age. In 2016 the youngest member of Generation X will turn 40 and, most importantly of all, the next generation – the iGeneration – enters legal drinking age in 2016 as their oldest members turn 21. Taken together, these two years will be transformational to the U.S. wine market. At Wine Opinions, we have conducted the most extensive generational research of wine drinkers ever, and our findings are detailed in our American Wine Generations report. Much of the discourse about generations and how they influence the wine market focuses on the long reign of Baby Boomers as drivers of the market and the fact that Millennial wine drinkers as a group are now edging ahead in total wine consumption. Soon, as the oldest members of iGeneration reach legal drinking age, a new topic of conversation in the wine industry will emerge, as marketers speculate on the tastes, beverage alcohol preferences, and rates of adoption of wine among this group of 61 million. Lost in all of this is Generation X. While there are 79 million Millennials in the U.S., and 75 million Baby Boomers, there are merely 49 million members of Generation X. However, their importance to wine marketers has never been greater and continues to grow, as they reach their peak earning years. According to the Bureau of Labor Statistics, the average household spending by generation in 2014 was $43,942 for Millennial households, and $58,202 for Baby Boomer households. But for Generation X, average household spending was $63,137. And the same report showed that average household spending on entertainment was highest among Generation X households. Moreover, Gen X consumers are willing to spend on higher priced wines. A recent report from an online wine seller shows that the average bottle price of wines sold to Generation X customers was higher than that paid by either Millennials or Baby Boomers. Recent Wine Opinions consumer surveys also point to the importance of Generation X wine drinkers. Among all high frequency wine drinkers surveyed, Generation X wine drinkers have, on average, made more winery visits than Millennials in the past year. And though conversion in tasting rooms to winery club membership is still highest among Baby Boomers, some 35% of Generation X winery visitors in the past year joined a wine club, compared to 24% of Millennials who did so. Wine marketers – especially those selling wines over $20 – would be well advised to pay attention to consumers between the ages of 40 – 51. They are spending more than any other generation, they spend nearly as much on wine as Baby Boomers, and they are outspending Millennials.